Bring your appetite and your imagination! At Fruits & Roots, you’ll find 100% plant-based vegan cuisine crafted with love and imagination. Whether you’re a loyal vegan or a first-timer, we invite you to discover flavors and excitement you never thought possible. We offer a complete menu of creative vegan fare, including imaginative daily specials, our famous cold-pressed juices, smoothies, delicious desserts and so much more, using the freshest locally sourced and organic ingredients with many gluten-free options. We are located in beautiful downtown Stuart, Florida, serving happy food to happy people! Our restaurant is committed to providing fresh, organic and healthful vegan cuisine that is 100% plant-based and thoughtfully prepared. In addition to a wide selection of delicious vegan sandwiches, wraps, appetizers and creative daily specials, we offer house-made soups, salads, smoothies, acai bowls, oat bowls, bagels, flatbreads and amazing desserts – all loaded with nutritious and healthy ingredients with many gluten-free options. You’ll also find a wide assortment of cold-pressed juices made fresh daily, along with French Press coffee, craft beers, wine, ginger beer, kombucha and a variety of flavored mylks. For an extra boost of health and energy, we offer nutritious elixirs and shots. We use only the freshest locally sourced fruits and vegetables, whole foods and all-natural ingredients to create delicious fare that appeals not only to fans of vegan and vegetarian food, but also to lovers of good and wholesome food everywhere. We offer a warm and relaxed atmosphere for interior dining plus an expansive patio with outdoor seating. Fruits and Roots Juice Bar and Vegan Café is located at 710 South Colorado Avenue, Stuart, Florida 34994. Call us for take-out and special orders at 772-678-6627. We offer a warm and relaxed atmosphere for interior dining plus an expansive patio with outdoor seating. 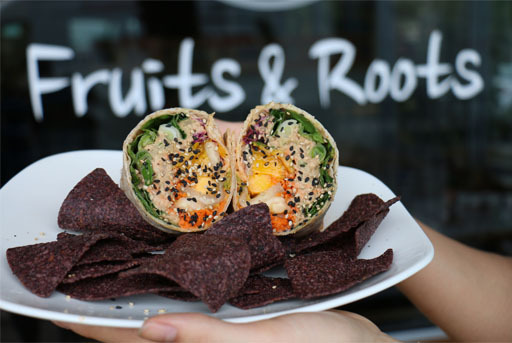 Fruits and Roots Juice Bar and Vegan Café is located at 710 South Colorado Avenue, Stuart, Florida 34994. Call us for take-out and special orders at 772-678-6627. Excellent fresh food and service is great! Really nice location very warm and welcoming! I only wish I lived closer I would be in every day. Lots of options even gluten free, and the food is very fresh and flavorful. I had a salad and flat bread. Flat bread was out of this world especially for being vegan and gluten free. I have been to lots of vegan restaurants and this is def one of my top 5 and I can’t wait to be back in the area so I can go back! Took my mother-in-law since she recently relocated to the area and neither of us are vegans but there is something for everyone on the menu. My favorite is the summer rolls which were ordered and we also had then hearty creamy vegetable soup which had amazing flavors along with the spinach flatbread. It was heaven in our mouths. Thank you once again for superb service from beginning to end and the chef even came out and asked us how our meal was. We love this gem! A great staff and beautiful set up. The cauliflower and garlic flatbread is going to leave me craving this stop for lunch for years to come. They have a great staff and beautiful set up. The soup was on point! And man those wheatgrass and ginger shots….wow! Love this place. First time going there with my husband and it was amazing! Who knew being vegan could be soo delicious! The food was so fresh and melt-in-my-mouth good. The atmosphere was cozy and the staff and our waiter Seth were awesome. I am so happy I found this place. We will definitely be back for more. Fruits and Roots Juice Bar and Vegan Café is located at 710 South Colorado Avenue, Stuart, Florida 34994. Call us for take-out and special orders a 772-678-6627. Follow us on Facebook, Instagram and YouTube to stay on top of specials and find out what’s happening in our world. To view our menu and all our healthy ingredients, go to www.fruitsandrootsvegancafe.com/menu/. information on all that is 100% vegan.